Food is medicine. To understand this dictum well one needs a better understanding of food, where it comes from and how it is cooked, and why the food is considered as a blessing of God in our cultures as well. 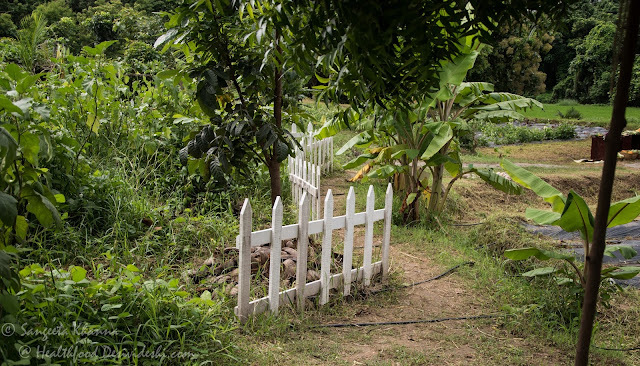 It is a blessing to be able to get one's food growing in the vicinity. Growing even small pots of herbs and greens makes one aware how much more flavour and nourishment we get from organically grown fresh harvest. So if one gets an opportunity to learn more about healing through food it is not to be missed. 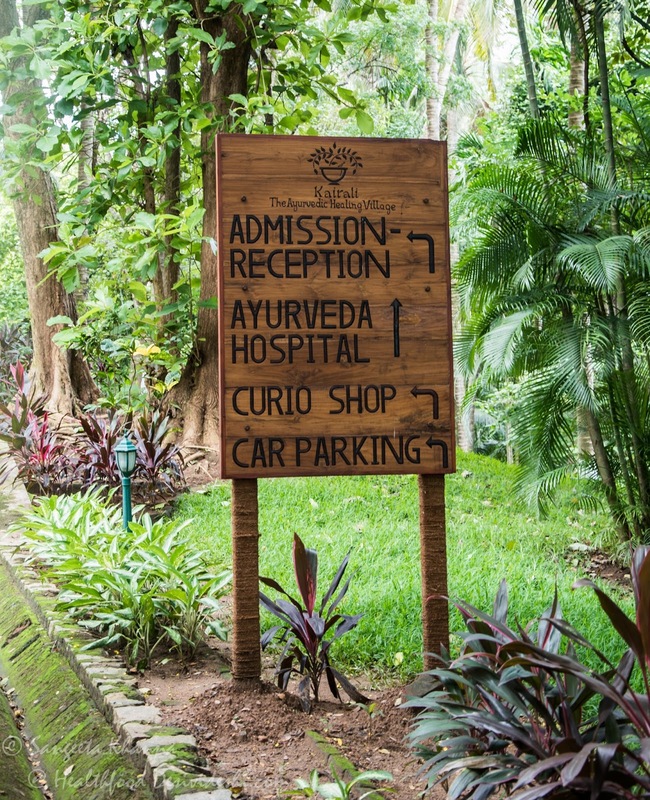 Earlier this month I made a trip to Kerala, the most verdant state in south India, to get acquainted with the ways of healing through the ancient science of Ayurveda. Kairali, the well known Ayurveda wellness group has constructed a healing village and spa resort in Palakkad district of Kerala and I was expecting a good experience through the 3 day Chefs retreat they were hosting. 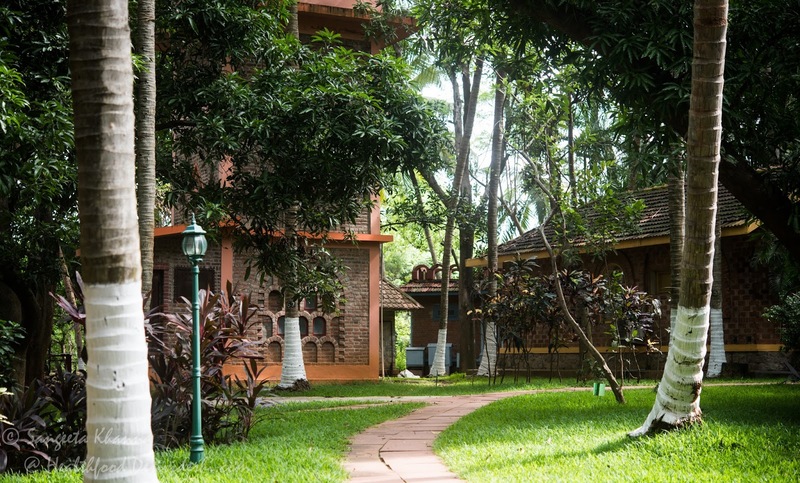 The Kairali spa and resort is the vision of Mrs. Githa Ramesh (Joint Managing Director, Kairali Group) who is an Ayurveda doctor, a biochemist and hails from a family of traditional Vaidyas. 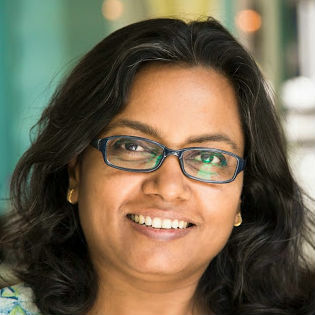 Along with her husband Mr. K. V. Ramesh and her son Abhilash K. Ramesh, she has created a center of healing that attracts guests from all over the world to get treatments for conditions ranging from obesity to arthritis, skin conditions and migraine etc. 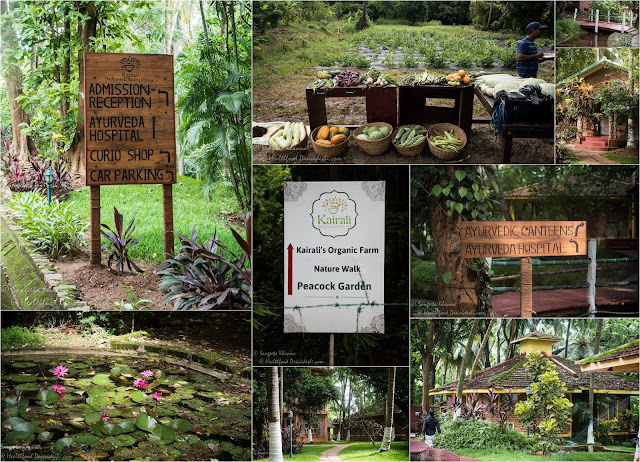 Kairali has 35 centers spread across 10 countries and also has a pharmacy unit, most of the medicines and treated oils they use for the spa and healing centers are manufactured by themselves. We visited the manufacturing unit and saw how they follow the ancient methods along with technology to manufacture the medicines and cosmetics. The resort is constructed in accordance with nature, the landscaping is fluid with a huge variety of plants and there is a water channel that runs along cobbled paths, the residential cottages located on either side of the wavering water body. There are low bridges in some places and pink water lilies blooming in some other spots, butterflies fluttering everywhere. In fact I followed the cobbled pathway along the water body as soon as I reached and did a complete round of the property. 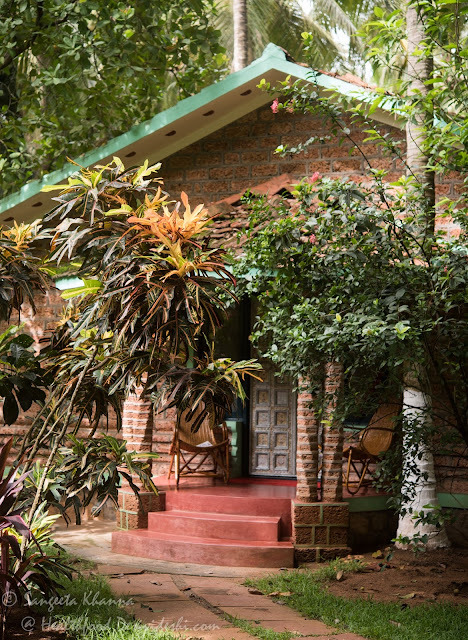 The birds, butterflies and other insects make for a great company and I can spend a long time in such places, especially if it is equipped with highly efficient ayurvedic treatment center and freshly made vegetarian food to heal the mind, body and soul, however cliche it sounds. This was my cottage where I went only to sleep because there was so much to experience. Coming back to the chef's retreat, the line up of masterclasses and experiences over 3 days left me wanting for more trust me. The theme was Healing recipes : Back to roots, and four specialist chefs from different parts of the country had come together to talk about cooking healthy food using local produce of the season, how to keep our food habits and food choices sustainable in the long term and how the traditional wisdom has all the answers. Chef Manjit Gill talked about Drumsticks and used the drumstick pulp and leaves in his food, Chef Vikas Seth used ragi and local vegetables to create a Mexican meal, Chef Abhijit Saha talked about micro-greens and super foods and Chef Arun T.K. used all parts of a banana plant to cook several dishes ranging from pancakes, spiced buttermilk, curry and chutney. These interactive masterclasses were great opportunities to learn and exchange ideas. Later Mrs. Githa Ramesh conducted a masterclass and talked about healing properties of food, how the ingredients should be combined and cooked for optimal nutrition. Later I talked to her about balancing the recipes according to the three doshas (Vata, Pitta and Kapha) and she shared her wisdom generously. I will keep sharing those nuggets with you all here in future too. Apart from these masterclasses we attended a session on the basic principles of Ayurveda conducted by Dr. Sarvan. I had many questions to ask and I learnt how Kerala has so many local elements of Ayurveda being followed in everyday life. This particular region is a biodiversity hotspot and so many local herbs are employed for treatment of acute and chronic ailments, no wonder the Ramesh's are the 7th generation of Vaidyas in this Ayurveda heaven of sorts. 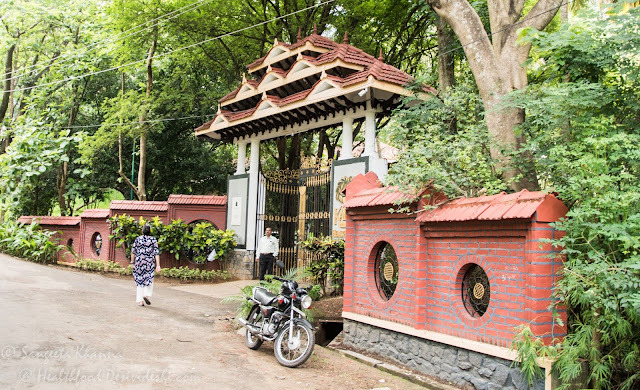 The treatment area of Kairali is like a sanctuary within a sanctuary and the Abhyangam and Elakizhi treatments I got, felt so good for my body. All the treated oils are made in-house and the masseurs are trained perfectly, one washes off all the oil with lentil powders which leaves the skin feeling supple and energized. 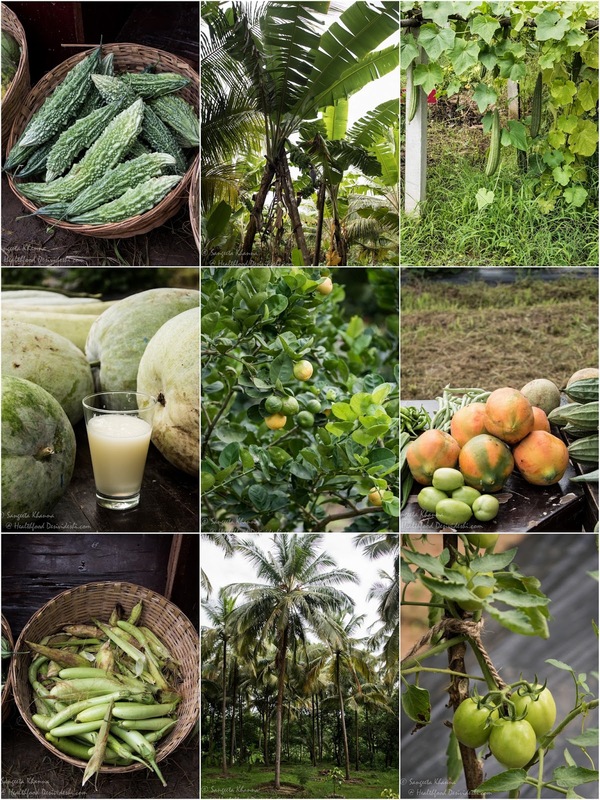 Kairali is almost self sustainable as it has farms and plantations, all organic and natural. I got to know they compost all their kitchen waste and since they don't use refrigeration and all food is cooked freshly, there is minimal plastic usage too. I didn't see any plastic at least and mighty glad about it. We were served breakfast in the midst of the farm after a leisurely morning walk through the farm and orchard, there is a natural stream that flows along the boundary too by the way, indicating how blessed this property is. The idiappams and stew, a delicious upma, the juices and fruits served at this breakfast were just a glimpse of what is served at the dining tables for guests as well. Farm to fork is a way of life there. In fact I need several blogposts to write about the food and recipes I learnt there. 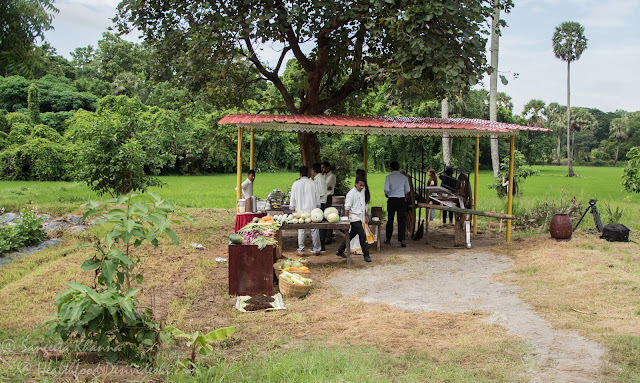 We had an elaborate Sadya meal served one afternoon and a homely frugal meal served at the staff canteen another day and each time the taste was reflective of the fresh produce and skillful cooking. The tea time snacks were always something steamed, light and extremely tasty. Steamed rice cakes and feather light poha one day and steamed rice balls with coconut the other day, the confereence food could be so healthy one has to experience at Kairali indeed. 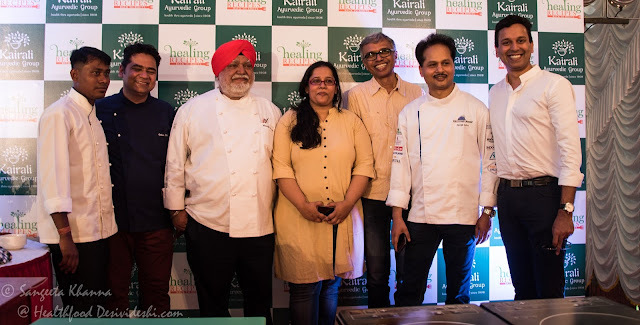 The food speaks loud about the fact that nothing is refrigerated in Kairali kitchen and everything is cooked fresh. Some unforgettable flavours of avial, mor curry and matta rice will linger on.